Indian Health Service Seeks Permanent Director : Shots - Health News President Trump first nominee to lead the Indian Health Service is out of the picture. Montana's senators are urging the administration to name a new nominee quickly. Sens. 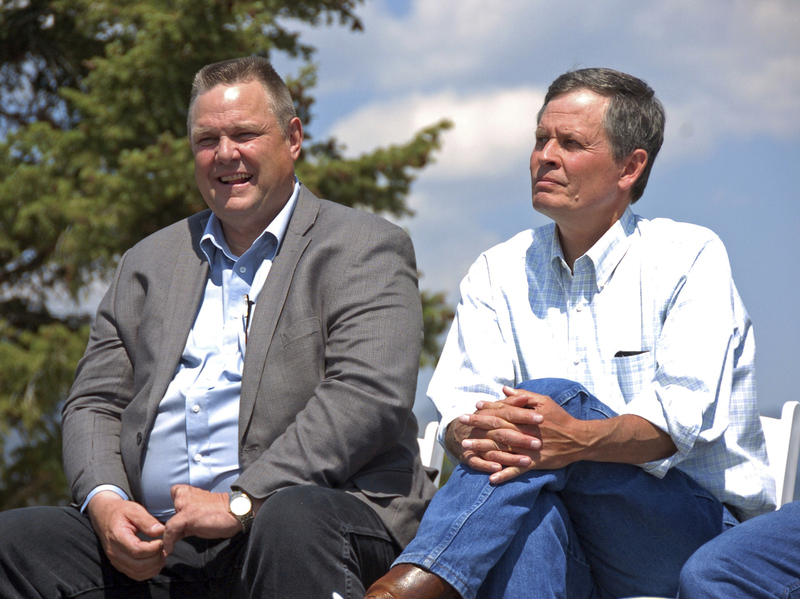 Jon Tester, left, and Steve Daines, speaking together in Jardine, Mont., in August 2017. Both said recently they want the Indian Health Service to have new, strong leadership soon. The insurance broker President Trump nominated to lead the Indian Health Service, Robert Weaver, is firing back at the White House and the media after his nomination was withdrawn last week. "The allegations raised against me in the media are baseless, irrelevant, and in the most important cases simply incorrect," Weaver said in a press release Tuesday. In January, The Wall Street Journal quoted a former colleagues of Weaver alleging that he had exaggerated his prior work experience. More recently, there were reports that he voluntarily withdrew his nomination to head the IHS. But Weaver said in a letter to tribal leaders and supporters published Feb. 22 that the characterization was inaccurate. "Regardless of what the press reports may say, I was forced out," Weaver wrote. "I was involuntarily withdrawn." In his letter he said he "received a call giving me two minutes this past Friday afternoon at 4:30pm, on a three day holiday weekend, to decide to withdraw or face the public humiliation of having the White House withdraw my nomination, as demanded by a staff person from HHS." Weaver hasn't replied to an interview request from NPR. The Trump administration hasn't named a new nominee to lead IHS, which has been without a permanent leader since 2015. Democrats and Republicans on the Senate Committee on Indian Affairs are both urging the White House to name a new nominee quickly. "I'm expecting better, and I hope the administration will send us a highly qualified candidate," said Montana Republican Sen. Steve Daines. He said he didn't get a favorable impression of Weaver when they met after he was nominated. Sen. Jon Tester, a Democrat from Montana who is also on the Indian Affairs Committee, said Senate "due diligence" revealed problems with Weaver's statements about his education and work history. But Tester said he doesn't fault the Trump administration for sending them a candidate who was not properly vetted. "I think this can happen," Tester said. "What I think is really important moving forward is that they get us somebody much sooner than later. So we can get them confirmed. ... If they dilly-dally on this, and this position's left open it's a major problem for Indian Health Service and not good for our Native American folks that are depending upon Indian Health Service for their health care." An estimated 3.7 million American Indians and Alaska Natives eligible to receive care from the IHS. In treaties, Tribes were promised health care in return for giving up nearly all of their ancestral lands to the federal government. This month the National Indian Health Board told Congress that the current IHS budget of $4.8 billion dollars will meet less than 47 percent of the need for Native American health care nationwide. But that group of tribal leaders says that bigger picture, the agency needs far more funding. A report it published last year says the real health care needs in Indian Country require a $32 billion infusion the IHS, phased in over 12 years. Daines isn't convinced money is the problem, and wouldn't commit to whether he thinks IHS can function properly on its current budget. "Throwing more money at it isn't going to solve the fundamental problem of lack of accountability and lack of leadership," he said. "You need to prioritize and look at where we spend the money," Daines said. "One of the areas we need to address is to insure that the compensation structure for the health professionals that serve, the folks that are right there on the front line, delivering health care in Indian Country, that the wages they're provided are competitive, so that we can attract and retain good health care professionals. That is an area that needs to be addressed, and that's what we need to prioritize." For his part, Tester said, "It's well documented that IHS has been underfunded now for decades, and you can't get blood out of a turnip, you can't get health care out of an agency that doesn't have enough money to be able to do the job that they're required to do. "Congress also needs to do its job and make sure IHS has the dollars it needs, no more, no less, to do the job that's required, and that's to take care of the Indian people," he said.